Morningstar hasn’t ranked this Janus Fund yet. Since its inception, it has 3 month return of -0.83%. You can buy this mutual fund with $2,500 initial funding. There are Other classes are: Class C (JUCCX), Class A (JUCAX), Institutional Class (JUCIX), Class N (JUCNX), Class S (JUCSX), and Class T (JUCTX). Top 3 holdings are U.S. Treasury Notes/Bonds, 0.50%, 06/30/2016, U.S. Treasury Bill, 0.00%, 05/28/2015, and U.S. Treasury Notes/Bonds, 0.38%, 05/31/2016. Top 3 assets are U.S. Treasuries (70%), High Yield Bond (19%), and Investment Grade Bond (4%). Top 5 sectors are energy, technology, consumer cyclical, banking, and consumer non-cyclical. This bond fund has weighted average maturity of 4.49 years. The weighted average coupon is 1.91%. The weighted average duration is 3.30 years. 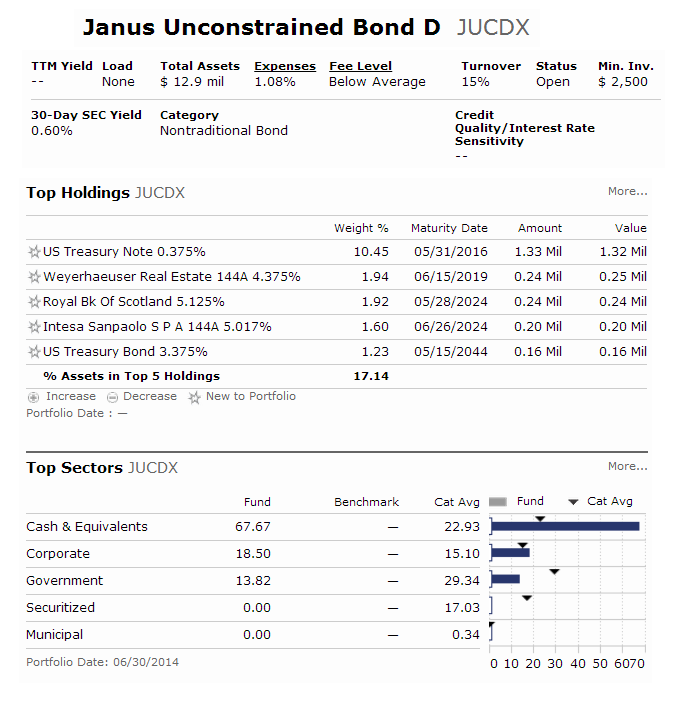 This Janus Global Unconstrained Bond Fund will be managed by Bill Gross. Bill Gross has good track record managing variety of PIMCO Funds.